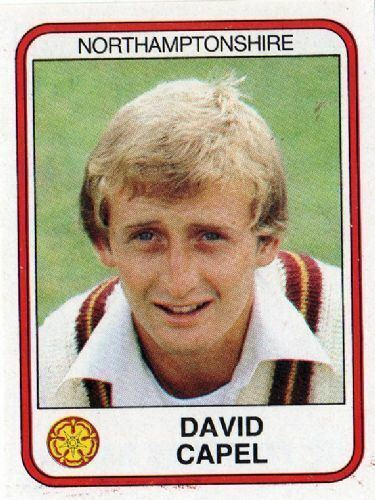 David Capel (born David John Capel, 6 February 1963, Northampton) is a former English cricketer, who played for Northamptonshire and England. Cricket writer, Colin Bateman, noted that "Capel was one of those unfortunate cricketers who became tagged as being the next all-rounder to fill Ian Botham's boots". An irrepressible enthusiast, Capel was a batsman who bowled but, because of his dual role, found himself pushed down the order. He played fifteen Tests and twenty-three One Day Internationals for England. He was discarded with a batting average below 20, and a bowling average above 50 in both forms of the international game. However, he did score 98 in punishing conditions in Karachi in 1987/88, and dismissed Viv Richards three times, as well as forming part of the pace quartet which won in Jamaica in 1989/90. Capel played first-class cricket from 1981 to 2003, scoring 12,202 runs at 29.68, with a highest score of 175, and taking 546 wickets at 32.18, with a best bowling return of 7 for 44. Capel ran the academy at Northamptonshire after finally retiring from the field and, at the end of 2006, was appointed head coach of his beloved county. On 2 July 2012, Northants Cricket had announced that Capel was to leave his position as head coach/manager. Second XI coach David Ripley would fill his role, and Phil Rowe would take over the role of Second XI coach as well as the Academy. In 2013 Capel took on a role with the England women's team.